This is the final of four posts covering the Skype Shop – an introduction, qualifying products offered, learning about an individual product and, finally, making purchases and follow-up. 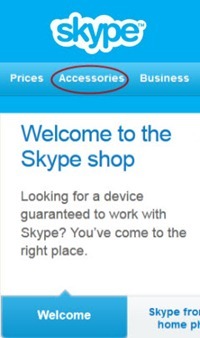 The first post of this series provided an over view of the Skype Shop (or Skype Store) and how to locate catalogue pages listing categories of accessory hardware products that can enhance the Skype calling experience. The second post provides the background for what qualifies a product to appear on the Skype Store. The third post discusses product presentation, including newly introduced for customer feedback and comparison shopping features. Having selected product(s) for purchase, the customer will want to complete the purchase transaction and receive the product(s). While a purchase transaction is usually relatively easy to complete, there are many issues behind the transaction to ensure privacy, transaction information security, timely delivery and follow up customer service and customer support. At the same time Skype needs to ensure a high quality, secure, responsive customer process to protect its brand reputation. As a result the hardware vendor must initially determine to which countries it wishes to sell its products and establish a relationship with e-commerce merchants or retailers who have the appropriate transaction, shipping and import arrangements to successfully complete a purchase delivered into the destination country. While products are listed on the Skype Shop, Skype does not handle the actual purchase transaction. The Skype Shop actually comprises 70 country “stores” supporting over 40 currencies in 16 languages. Think of each Skype country Shop as a virtual shopping mall with several Global Partner Merchants, or online Retailers, who actually sell product. When a customer goes to the Skype Shop, s/he is actually taken by default to the “local country” Skype Shop, based on the customer’s IP address. The customer can then select product; however, on clicking on a “Buy now” button, s/he is taken to a shopping cart offered by a “Featured Retailer” who has inventory of the product to complete the actual purchase transaction. Should a customer wish to purchase a product for delivery to another country, it is necessary to go to the destination country store by going to a drop down box at the lower left side of any Skype Shop page. In some cases it may not be possible to order a product for delivery to another country. The Featured Retailers include Chat and Vision, eBuyNow (formerly InStoreSolutions), Microsoft Hardware store, Logitech Shopping Cart and Sony Store amongst others, depending on the actual product manufacturer. Global Merchant Partners that may come up for comparison shopping include Amazon, Amazon Market, eBay merchants and Buy.com, amongst others. Whereas the Chat and Vision and eBuyNow support several vendors’ products, the “vendor-specific” stores will usually only include their own (Microsoft, Logitech and Sony) products. 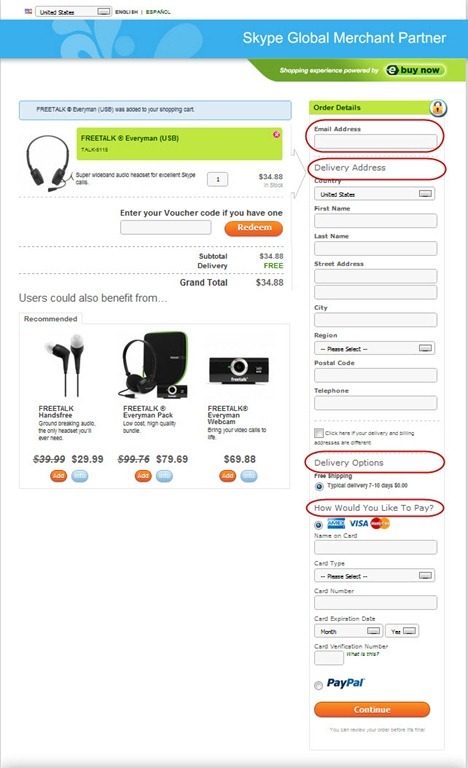 An example order form is shown on the right; click on the image to enlarge it. Critical information required are your email address, a delivery address, a billing address if different from the delivery address, delivery options (free or charged) and payment details (credit card or PayPal). There may also be options to add products to the shopping cart. Customers should keep these emails with their transaction reference number for any follow up issues. Contact information should be on the emails mentioned above. Does price include VAT (Europe), HST/GST (Canada) or other consumption taxes? does the offer include, say, one hour of Skype credit or bundle some software such as Vodburner? 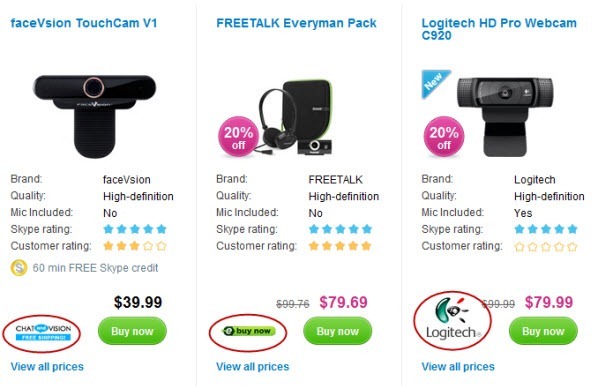 are there product bundles such as the FREEETALK Everyman Pak that combines a headset and HD webcam. Taxes – you can’t avoid them. The Featured Retailers will collect VAT in Europe and GST/HST in Canada. Both Chat & Vision and eBuyNow include these taxes in their prices along with “free” delivery. Check with other retailers for their tax and delivery policies. A Canadian issue: The one issue they need to address from time-to-time is exchange rates. For example the U.S. Dollar to Canadian dollar exchange rate has changed from U.S. $1.00 = C$1.30 in early 2009 to its current (March 2012) U.S. $1.00 = C$1.00. Yet we still see price differences between U.S. pricing and Canadian pricing that are more than the ~15% that allows for a GST/HST tax differential. For example Chat and Vision sells the FaceVsion TouchCam V1 for US$39.99 or C$62.99. That’s a 58% difference where the tax differential should be, at most, 16%. As another example, the FREETALK Everyman HD webcam, sold through eBuyNow, sells for US$69.88 on the U.S. store and C$84.88 on the Canadian store – a more reasonable 21% difference if one takes into account a buffer for small exchange rate variations. A more challenging Canadian issue for these Feature Retailers would be to collect the GST/HST based on province as the tax rate also varies by province. The good news is that only one (federal) registration is required to cover all those provinces that use the HST to cover both federal and provincial tax. These retailers also have the infrastructure required to support replacement product and product return issues, when warranted in the context of a customer experience. Purchase of applications in the Apps Directory is normally through an online e-commerce site hosted by the software developer, such as Sendix (Pamela, PamFax) and Netralia (VodBurner). Of course delivery is via an immediate download of the software. Bottom line: the Skype Shop provides a worldwide online retail channel for Skype hardware accessory vendors and software application partners. With 70 “country stores” it opens up much broader product distribution for a hardware vendor while making Skype-certified product available for purchase in many countries where the hardware vendor may not have a “bricks and mortar” retail relationship. The Skype Shop is essentially a virtual shopping mall built around business relationships with both hardware vendors and e-commerce retailers to make product readily available worldwide. The bottom line is to provide hardware and software that can enhance or optimize the Skype calling experience.